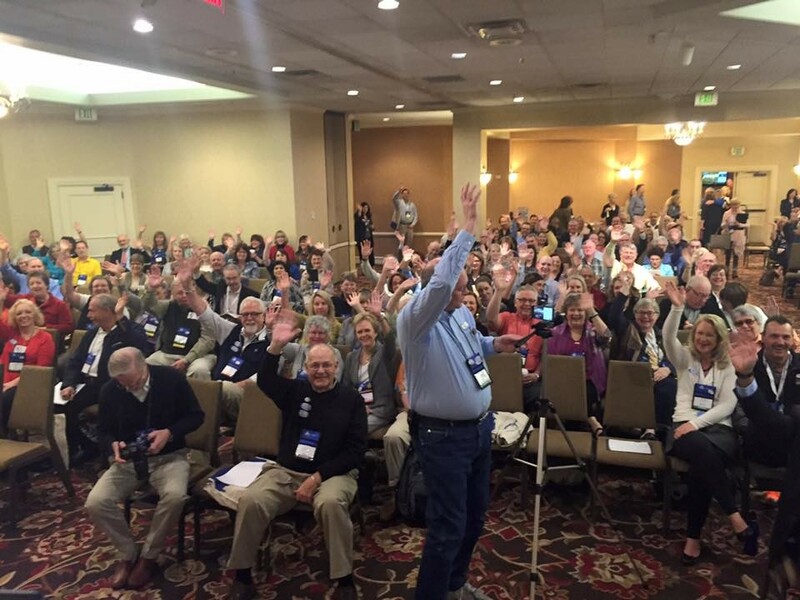 After spending the day with all these great innkeepers I was thinking about the best group noun for us all – and it’s obvious: “A smile of innkeepers”!” Reflections of The AIHP Summit and Marketplace by Peter MacLaren, innkeeper of the West Hill House B&B in Warren Vermont. The first AIHP Summit and Marketplace in Nashville TN ended with a huge round of applause. I can say, and many others who attended would agree that the conference’s success rate…five star. 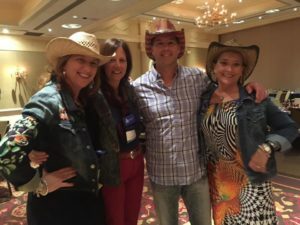 CEO Rob Fulton released a newsletter on April 18th post summit, and shared some innkeepers and allied partners comments. 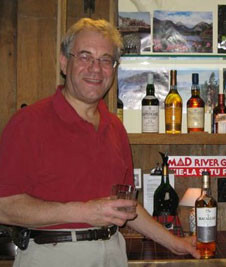 I thought Peter MacLaren expressed his feelings so well. So much that it is the title of this blog. I wish now that I had taken some time to take photos of all those smiles. Luckily others did. Those of you who did not attend may ask; why was this conference so successful and why did it evoke so much emotion and enthusiasm? 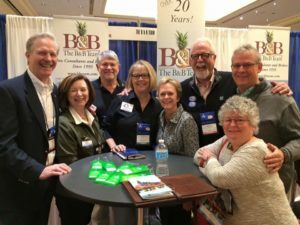 We were all attending for one core reason, to become better innkeepers and partners with innkeepers. We do this by learning new skills to help our businesses grow. We also do this by developing relationships which requires give and take, we learn from each other. And what better way to do this then face to face, smile to smile. Twyla Sickmiller (isn’t she always smiling!) Helping innkeepers with orders. Founding AIHP Member The Turkish Towel Company. There was an ‘energy of solidarity’, if you get what I am trying to say. We were all working together. This is what I believe helped create all those smiles. There was of course a lot of planning and investment in time to create the summit. From the time of AIHP’s conception to the opening of the summit it took only 18 months! I think this is incredible. A total positive and forward thinking group of individuals formed the foundation of AIHP that resulted in a CEO search and hire, board creation and staff hire and recruitment of membership. Then a wonderful group of volunteers completed the package. With CEO Rob Fulton and a strong board of directors at the helm and an experienced crew in support, the future looks very bright. Speaking of helms and crews. These terms will come in very handy at the next summit. 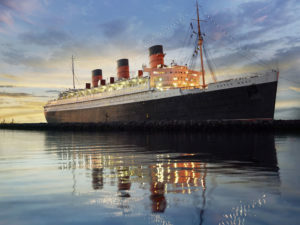 If you haven’t heard already, the 2017 Summit and Marketplace’s location will be on the solid foundation (docked in Long Beach) on the original Queen Mary in Long Beach CA. 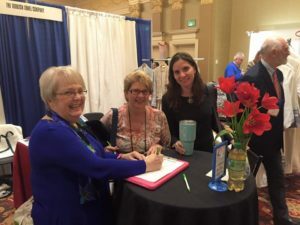 CABBI (California Association of Boutique and Breakfast Inns) and Select Registry have come on board as partners with AIHP for this conference. Forging relationships like these make all of us stronger. The B&B Team-most of us- adding to the smiles! This entry was posted on Sunday, April 24th, 2016 at 8:55 pm	and is filed under Innkeeping Events. You can follow any responses to this entry through the RSS 2.0 feed. Both comments and pings are currently closed.